I know I use a lot of superlatives to describe the food I love. It’s just that I am so passionate about it all. I do find though, that I’m nearly running out of words when trying to describe this ginger-glazed salmon dish. It’s light, it’s fresh and the gorgeous flavours go so well together it’s like having a beautiful symphony playing in your mouth. I am big advocate for quinoa and often use it instead of couscous. Quinoa is healthier and contains a lot of protein so it is a good thing to serve with vegetarian food - it is also better for your waistline. When I do use couscous, like with this dish, I will only use wholemeal (wholewheat) couscous. This is about taste just as much as health. Wholemeal couscous taste so much more than refined couscous which, let’s face it, has virtually no taste at all. I use the zest of lemons and lime quite a lot, like in this ginger-glazed salmon recipe. While it is easy to find unwaxed lemons, it’s not always easy to find unwaxed limes. If you can only get hold of waxed lime fruits, make sure you scrub them really well with a clean scrubbing brush. And when grating the zest, don’t be too forceful. You only want the very outer layer of the fruit, not the bitter pith, the inner white part. I find that it’s worth investing in some really good graters with different coarseness. You want a fine grater for citrus fruit. I know it may seem extravagant, but I have two really sharp fine graters and use one of them solely for grating citrus zest. 1. Preheat the oven to 200C/fan180C/400F/gas mark 6. Mix together all the ingredients for the marinade. Cover a baking tray with baking parchment and place the salmon fillets on top. Divide the marinade over the salmon fillets. Leave to stand for 10 minutes. 2. Season the salmon with salt and pepper and place the baking tray in the oven. Cook in the oven for 10-12 minutes, or until cooked through. 3. While the salmon is cooking in the oven, heat the vegetable stock to boiling point. Mix the couscous with the lemon and lime zest and 1 tablespoon of olive oil in a bowl and pour over the hot stock. Cover the bowl with cling film and leave to the side. 4. Add the sugar snaps to a pan with boiling water and cook for 2-3 minutes. Drain and chop the sugar snaps in half. Take off the cling film and fluff up the couscous with a fork. Add the sugar snaps, chopped spring onions and pomegranate seeds to the couscous. 5. 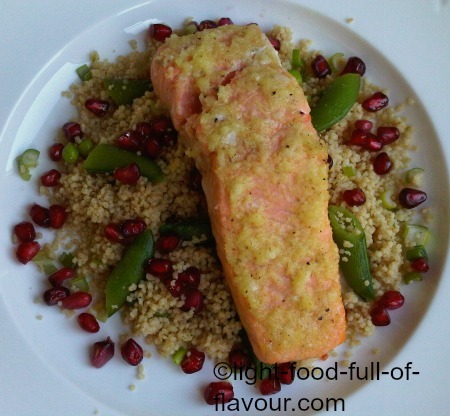 Divide the couscous between four plates and serve with the ginger-glazed salmon on top.